The letter writer was concerned that the Trump position and supporting the Trump policy on this matter would mean that the peace process would have to come to an end and that support for being opposed to the two state solution would in some way jeopardize bipartisan support for Israel in Congress. Another frequent letter writer from outside of New York is a dedicated Democrat and has stated the firm belief that Donald Trump is the worst and most dangerous thing for the United States and, he adds, for Israel as well. He insists that there is something wrong with our editorial positions since we consistently seem to support conservative and rightist positions on so many issues. Of course, just because a reader out there harbors a different view or position on some of these matters does not necessarily make us wrong and it certainly does not make them right. What we have here is a difference of opinion, and each of us may feel strongly that our differing opinions on these matters are the correct ones. While I do not respond to most letters, I did respond to the two referenced above. I explained, as I think I also expounded upon last week, that there is something fundamentally irreconcilable with believing that a Palestinian state can be created while at the same time supporting Jerusalem being recognized by the United States as the capital of Israel. 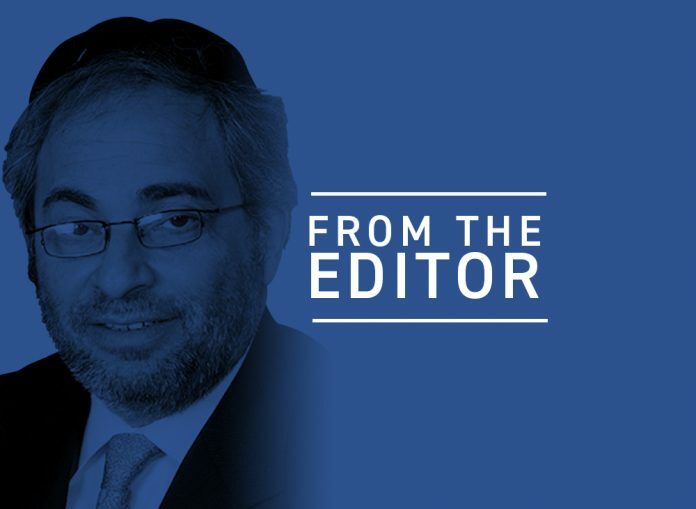 Critics say that the weakness here is that while President Trump recognized Jerusalem as Israel’s capital, he did not define what he sees as the borders of Jerusalem. The idea behind this approach leaves the door open to taking a small fraction of recognized Jerusalem topography and roping it off, separating it, and maybe even building a wall around it and calling that area of Jerusalem the capital of Palestine. Our position is that no part of Jerusalem should have to be party to what is essentially a subterfuge. The media reported the other day that after more than a year, the Trump administration is ready to present its plan for peace in the Middle East. The different and reportedly unusual aspect to the Trump plan is that it does not call for two states, does not refer to settlements as an obstacle to peace, nor call for their evacuation or dismantling, and does not deal with the issue of Jerusalem. In a way, if Mr. Trump remains true to this plan, it is the best one ever offered because it is basically saying that if you folks want to get along, you had better sit down and just start working it out. Now, this is a position long held by Israel, as Prime Minister Netanyahu has offered talks without preconditions numerous times to the Palestinians without any reaction or response. The passage of time, however, and changes in the world have led Palestinian Arabs’ traditional allies to unprecedentedly abandon them, to stop paying tribute to their obduracy, and to look to the future good of their people and their own countries. We can even take this another step further and say love of the Palestinians has dissipated and been replaced by genuine affection for what relations with Israel can do for the Gulf and other countries. Mahmoud Abbas, who is 83 and more intransigent than ever, is prepared to go down for the count. But in retrospect, it can now be said that it has not all been his fault. Abbas has been terribly misled about what the end game was going to be. He was misled along with his old boss, Yasser Arafat, by Bill Clinton, they were misled by George Bush, and — more than anyone else — by Barack Obama and his secretary of state John Kerry. The premise for the multi-decade peace process that now appears to be at an end was the United States pressuring Israel to make territorial concessions to the Palestinian Arabs. For a very long time, it did not matter how dangerous the end result was going to be for Israel. The way the U.S. State Department and the United Nations saw it, Israel committed a grievous wrong by winning the Six Day War in 1967. If the victory could not be reversed then perhaps at least the result could be changed. Donald Trump is no doubt hearing it from his chief negotiator, Jason Green blatt, from his ambassador in Jerusalem, David Friedman, and from his son in law, Jared Kushner. And that is a challenge to the Arab side to see where they are willing to compromise for a peace that awards them at least a quasi state and, most importantly, improves the life of the man on the street. One of my critical writers sent me an analysis of these editorials, paragraph by paragraph, with his own commentary at the end of each one. In one recent letter, he offered to bet me $1,000 that the GOP would lose big in the midterm elections coming up in November. So here’s the thing. Though it has not been rolled out yet, the Trump peace plan looks like it is going to be brilliant. The key to the presentation is that in order to achieve peace, you have to want peace. Repeatedly rejecting ideas like the Palestinians have been doing is a recipe for accomplishing something between very little and nothing at all.